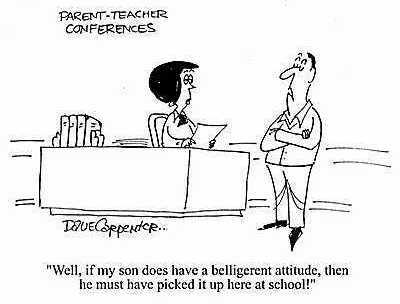 Oh happy day, it's time for parent-teacher conference season! As we prepare that first round of report cards, we're also bracing to meet the parental-type units of our many lovely darlings (especially our loveliest ones, if you catch my drift). Is it arrogant to admit that I reread my own advice on dealing with parent-teacher conferences? So be it. I just did. I suppose I'm ready. I have my gradebook all up-to-date in tip-top shape. I have anecdotal logs ready. The only thing I need to do is clean my desk, which pretty much always needs to be done. As A.A. Milne noted, "One of the advantages of being disorderly is that one is always making exciting discoveries." The saddest part of this is that I just cleaned my desk last week to make sure that among my exciting discoveries would not be any student work that didn't get counted towards the report card, which would not be an exciting discovery to my students or their parents. Alas, it's time for another clean. Any thoughts on the impending approach of this particular season? Please do share in the comments. P.S. : I do still update my own blog once or twice a week, typically. There's a bunch of new stuff up there in the past week or so. Click on over!